FLOURISH at VentureFest: How will CAVs look in a future of smart cities? Visitors to the University of the West of England Future Spaces were in for a treat on Friday 3rd February as they found themselves immersed in technologies of the future – from driverless cars, to robotic dogs, and even virtual reality dressing rooms! 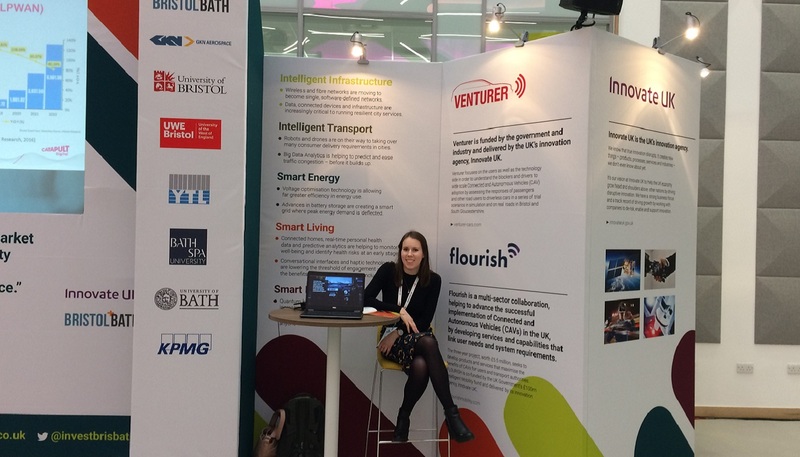 VentureFest hosted a diverse programme of seminars, panel discussions and an all-day exhibition - showcasing smart technologies that are transforming the Bristol and Bath region. Connected and Autonomous Vehicles are increasingly recognised as a key part of the future of smart cities. This was reflected in a number of discussions held throughout the day which included representation by the FLOURISH project. The event focused on how cities may look and function in a smart and connected future. Speakers from Zeetta Networks and Bristol Is Open presented on the growing ambition to make Bristol an open and connected city. FLOURISH was referenced here in relation to our work on CAV infrastructure, and potential integration and use of the 5G network. Additionally, Jason Collard from YTL Developments addressed how CAVs are an integral part of their planning for a future smart city, while Sam Mazloum from MasterCard spoke of his vision to get every single person in Bristol connected to an online financial system. This fits in with CAV connectivity as FLOURISH is dedicated to providing advances that benefit the whole community, but in particular older adults and those with mobility needs, especially in our creation of a ‘Human Machine Interface’. Overall, the day really emphasised the Bristol and Bath region as an innovative region for new technology, and consolidated FLOURISH’s place at the forefront of Connected Vehicle knowledge and research. To follow FLOURISH’s latest updates take a look at our Twitter @Flourish_Cars.